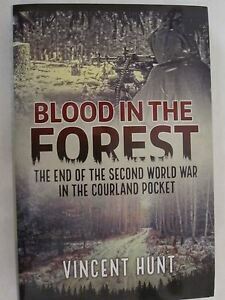 Blood in the Forest tells the brutal story of the forgotten battles of the final months of the Second World War. While the eyes of the world were on Hitler s bunker, more than half a million men fought six cataclysmic battles along a front line of fields and forests in Western Latvia known as the Courland Pocket. Just an hour from the capital Riga, German forces bolstered by Latvian Legionnaires were cut off and trapped with their backs to the Baltic. The only way out was by sea: the only chance of survival to hold back the Red Army. Forced into uniform by Nazi and Soviet occupiers, Latvian fought Latvian sometimes brother against brother. Hundreds of thousands of men died for little territorial gain in unimaginable slaughter. When the Germans capitulated, thousands of Latvians continued a war against Soviet rule from the forests for years afterwards. An award-winning documentary journalist, the author travels through the modern landscape gathering eye-witness accounts from seventy years before piecing together for the first time in English the stories of those who survived. He meets veterans who fought in the Latvian Legion, former partisans and a refugee who fled the Soviet advance to later become President, Vaira Vike-Freiberga, A survivor of the little-known concentration camp at Popervale and founder of Riga s Jewish Museum, Margers Vestermanis has never spoken about his personal experiences. Here he gives details of the SS new world order planned in Kurzeme, his escape from a death march and subsequent survival in the forests with a Soviet partisan group - and a German deserter. With eyewitness accounts, detailed maps and expert contributions alongside rare newspaper archive, photographs from private collections and extracts from diaries translated into English from Latvian, German and Russian, the author assembles a ghastly picture of death and desperation in a tough, uncomfortable story of a nation both gripped by war and at war with itself." While the world waited for Hitler's downfall, more than half a million men fought the six battles of the Courland Pocket in western Latvia Book jacket.
" ... The author's skilled use of interviews combined with his personal travelogue makes it one of the best books I have read in a number of years, as it successfully brings the long lasting impact of war on the Latvian people into stark focus. I look forward to reading more titles from Vincent Hunt in the future." "I wasn't even born when the newspapers heralded the very end of the second world war, but I'm willing to bet there was little or no mention of the Latvian affair, as uncovered by journalist Vincent Hunt. In fact, the hundred of thousands of Latvian and Red Army soldiers who died in the dying months of the war, must have bolstered by a considerable amount the final number of casualties of the conflict! Well written, compelling drama, made all the more readable by the author's persistence in uncovering eye-witness accounts of what actually happened." This book is very informative , interesting and well written.